The goal of each rescue conducted by Broadbent Wildlife Sanctuary is release back into native habitat. From the first moment they come into our hospital and rehabilitation center in Guston, Kentucky, our full-time veterinarian and staff of licensed wildlife rehabilitators work hard to get animals strong and healthy enough for release. Three Rescue & Releases Make National News! April 4, 2016 — Wildlife rehabilitators at Broadbent Wildlife Sanctuary had a lot of celebrating to do this past week. Two magnificent eagles were released on one day — a bald eagle and a rare golden eagle. 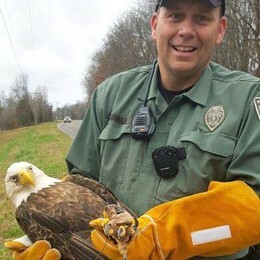 In December of 2015, Conservation Officer Tim Humble contacted licensed rehabilitator Donna Floden about a bald eagle on the ground in Marshall County. Donna and her grandsons assisted in capturing the magnificent bird and it was transported to Broadbent. 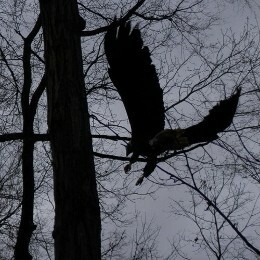 Dr. Mike O'Bryan examined the eagle and treated it for a wing injury with wing wraps. When it was ready for rehabilitation, it was moved first to a small cage, then to a large flight cage on the property. Three months later, Dr. O'Bryan and Broadbent Founder and licensed rehabilitator, Mary Ann Tobin, determined that the eagle was ready for release. 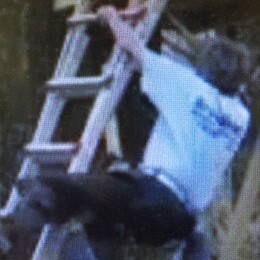 Broadbent staff built a platform where the eagle was found so it could be released and hopefully return to its mate. Bald eagles are known to mate for life. 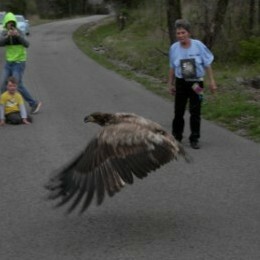 Just a few days before the bald eagle release, a rare golden eagle was found on the ground in Nortonville. It was brought to Broadbent by Kentucky Fish & Wildlife Officer Eric Chambers. Golden eagles are North America's largest bird of prey, with a wingspan of 6 to 7½ ft. They can dive on their prey at a speed of 150 miles per hour. Dr. O'Bryan determined that the eagle was poisoned by ingesting something toxic, most likely from eating another animal that may have been poisoned. After three days of treatment and rehabilitation, the golden eagle was also ready for release. 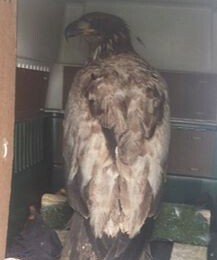 Both releases were scheduled for the same day, and the eagles were loaded up and transported to their home territories. 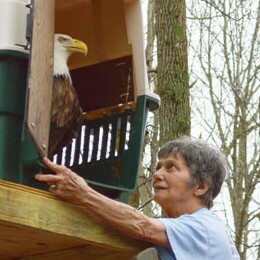 The bald eagle was anxiously waiting in the carrier on the platform, and Broadbent Founder, 75-year old Mary Ann Tobin, climbed the ladder to open the door, with employee Scott Hornback, nearby to ensure her safety. Tobin climbed the ladder and when she tried to open the door, she lost her footing and went crashing toward the ground — to be caught in mid-air by Hornback! Tobin climbed back up on the ladder — opened the door to give the eagle a glimpse at her native habitat — and the eagle hopped out and flew up over the trees and into the Kentucky sky. The Broadbent Wildlife Sanctuary staff and a small group of folks including Donna Floden, Officer Humble, and others who had been instrumental in rescuing and caring for these magnificent birds then drove to Nortonville for the golden eagle release. This bird was more than ready to get out of the carrier, so to ensure that she didn't injure herself, Dr. O'Bryan opened the carrier quickly and she took off over the lake. Two — actually THREE — successful rescues completed in one day! Videos of the bald eagle release have gone viral on the internet, and even made it on the Today Show! Broadbent Wildlife Sanctuary relies on donations to continue its lifesaving work. Donations in any amount are greatly appreciated!